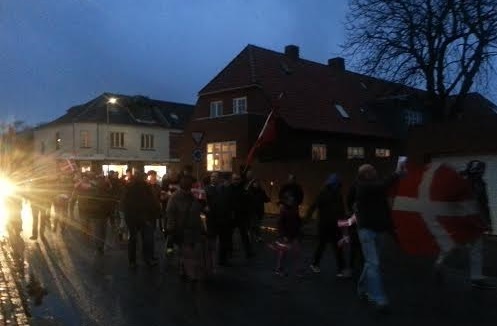 DENMARK: Last week SIAD had the 5th NO MORE ISLAM!- demonstration in our every-second-monday row of demonstrations where we gather people from the different towns in where we demonstrate. There will be 19 more demonstrations before we will demonstrate in Copenhagen to demand the politicians to stop the insane suicidal politics they are showing now. 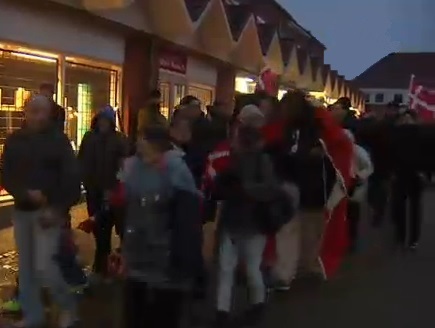 Denmark are at the moment receiving more Syrian regufees than 15 european countries altogether ! Worth to mention is that the Danish population is only 5 million people! It was a very succesful demonstration where we got new supporters and for the first time families with kids participated in the demonstration – a good sign. But of course there was a counter demonstration arranged by the communist fraction , Enhedslisten, who sits in parliament. Before the demonstration the media only let the counter demonstrators speak in the newspapers and did not let us defend ourselves, so when the newspaper had the nerve to send two journalists and a photografer to our demonstration, we asked them to leave and go for their partners in the counter demonstration. The journalists got very angry when Anders Gravers denied to shake their hands when they came and Anders made everybody shout “lying media, lying media”. Because of the bad attitude to our demonstration we have now chosen a town nearby to make our next demonstration in 14 days. 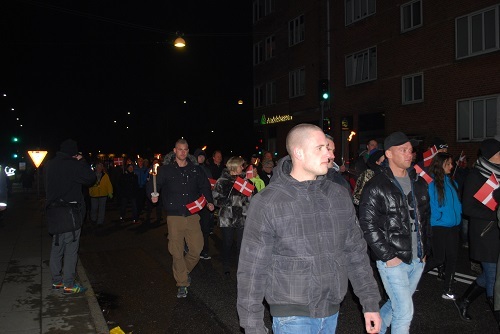 Categories: Demonstrations | Tags: demonstration, denmark, islam, islam critics, siad, sioe denmark | Permalink. Pope’s background is hardly thuggish. He claims to be a social worker who grew up in a Cambridgeshire does say that he is “middle-class”. He claims to believe that “the Muslim population brings a lot into the country” and insists Pegida is merely a “public awareness campaign” against extreme interpretations of Islam, not Muslims themselves. Even if that really is his intention, few believe his followers will prove so nuanced. Dipu Ahad, a 34-year-old Muslim who has lived in Newcastle all his life, has already received a death threat for planning a counter-demonstration on Saturday, which George Galloway, the Respect party leader, and Russell Brand, the comedian, are expected to attend. So the Muslims and their supporters complain about death threats? Welcome to our world. Opposing Islam nowadays means to most of us we could lose our work because it “offends” and many bloggers receive death threats every day. It’s perfectly fine to say “I hate Christians” or any other religion but with Islam it’s a problem. Where has our freedom gone? How can our people from our country betray us to such a degree and support Muslims? Whilst PEGIDA may look unstable as an organisation, at least they prove to have some balls. I know that most people from the North East of England are very proud and look well after their region. But there are also hugely islamised parts. This is where we have to spread our message and get more people on board. It’s NOT ok to stop a march because your local football team has got some Muslim players. Wake up, this is OUR country! Categories: Articles, Demonstrations | Permalink. 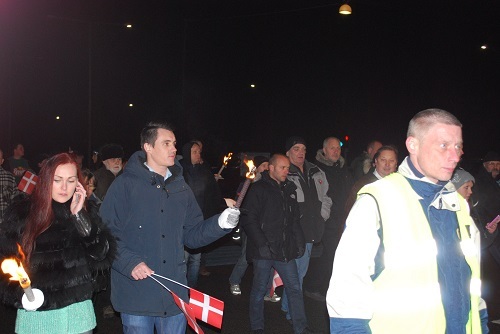 The second demonstration in the row of demonstrations took place in Esbjerg. Here the Danish flag in front. 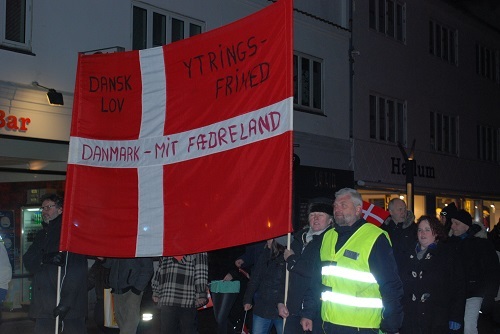 On the flag it says Danish Law, Freedom of Speech, Denmark – my country. 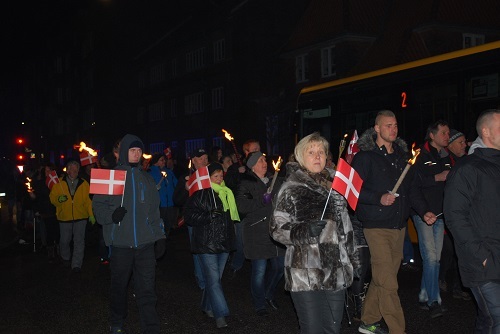 Mr. and Mrs. Danmark standing up for an important cause – Denmarks future without islam, by joining the demonstration carrying torches and the beautiful Danish flags. Young and elderly, tall and small were present at the demonstration Crack Islam. 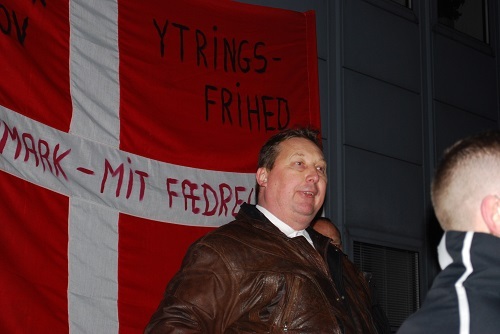 Leader of SIOE and SIAD Anders Gravers speaks to the demonstration and explains the purpose of the row of demonstrations. 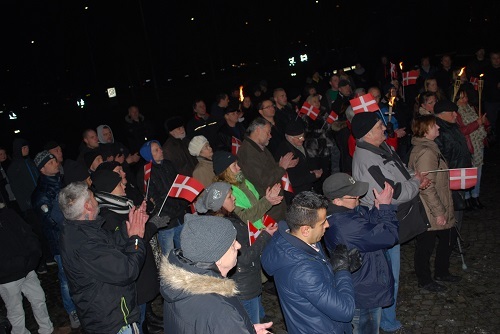 Demonstrators cheering as Anders Gravers tells that for more than 30 years we have been islamisised and now is the time to de-islamisise our country and show the lying media and the lying politicians that we are not going to take any more. 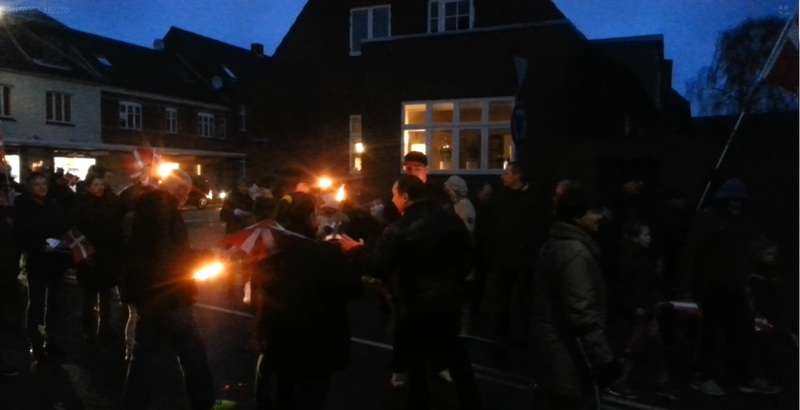 Categories: Actions, Demonstrations | Tags: demonstration, denmark, islam, siad, SIOE, wiederstand | Permalink. Mayor Yvan Mayeur banned SIOE’s last demo against halal slaughter in EU because he decided the name would insult the muslims. So we are now making a new demo where the main name of the demonstration will be Stop Islamisation of Europe and where we will have a vary of subtitles as can be seen on our banner. We believe that we are in our full constitutional right to demonstrate against islamisation in the capital of Europe trying to influence the politicians in the EU to stop the islamisation. We don’t want to be stopped by a mayor who has a majority of muslims in his council. We are now putting the options up – either we are allowed to have a peaceful demonstration outside the parliament at Luxembourg Square in Brussels May the 10th – or we will be banned again and then we will demonstrate spontaneously around in the town in thousands where no-one can forbid us and stop us baering t-shirts with the different demo slogans. Categories: Actions, Demonstrations | Permalink. Today Thursday around 3 pm. Anders Gravers leader of SIOE received a call from the police in Belgium. They had just finished a meeting regarding our demonstration Saturday the 8th against halal slaughtering in EU. 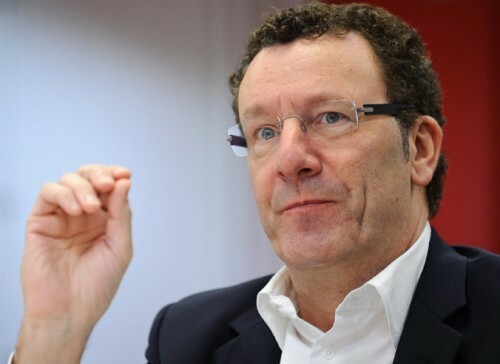 He had to tell Anders Gravers that it was not possible to permit the demonstration because the mayor of Brussels, Yvan Mayeur, has banned the demonstration. Anders Gravers asked why he banned it and the answer was that we have no right to know why but it could be the titel of the demonstration that was the problem. So the mayor of Brussels has banned our demonstraion with the animal caring name: Stop halal slaughter in EU. He seems to be as much as a dhimmi as the mayor before him , mayor Thielemans who also banned a SIOE demonstraion back in 2007 – 9/11 where we wanted to have a demo with the name: Stop the islamisation of Europe. Thielemans had a mayority of muslims in his council. Maybe the new mayor has the same problem. They come so late with the banning because last time they banned us in good time we organised a demonstraion anyway. A demonstration that led to the arrest of many politicians from Vlaams Belangen and Liga North Italy. We will arrange a new demonstration and will in any case go through with it because it cannot be true that as a European citizen you are not allowed demonstrate outside your parliament because a small part of the population around the parliament doesn’t like it. This is not a question about the town of Brussels but the capital of Europe where the man in the street can stand outside their parliament and tell the politicians they don’t agree with their decisions and in this special occasion tell them they are against animal cruelty as halal slaughter.